What does it say about our part of the world that our Syrian brothers and sisters feel the need to flee to a place where they are not wanted? To a place where they are being humiliated and insulted! What does it say about our wealthy #Arab_World blessed with vast empty tracts of land that our doors are closed to our own? The scenes dominating our screens are almost unbearable to watch. Tiny children washed up on the shore like flotsam. Hundreds lost under the waves of the sea of the dead or suffocating in the holds of boats. Pregnant women, children and the disabled in wheelchairs determined to get to the lands of promise only to find the way is barred with barbed wire, teargas and the batons of riot police. But on they go thirsty and hungry, their feet sore with blisters, catching a few hours of sleep in open fields, unable to wash themselves. On they go with babes in arms and toddlers astride their fathers’ shoulders fuelled by hope that tomorrow will be a better day because every weary footstep takes them closer to #Europe – and sanctuary. It is there that their dreams turn to nightmares. They have survived barrel bombs. They have lived through chemical attacks and escaped the clutches of terrorists. They have seen their homes turned into dust and their cities reduced to pockmarked moonscapes. They have witnessed atrocities that most of us cannot even imagine. They have buried fathers, brothers, and sons. And when the last leg of their marathon journey to the European Union is finally over with just a few hours train journey to their final destination, #Germany, they see their future slipping away, so near and yet so far. They have been told ‘Halt’. But fatigue and hunger does not make them waver. They refuse to be herded into wretched camps like criminals fearing they might languish there for months or even years. Hot and thirsty, packed into a train for 24 hours, they reject the bottled water offered by the police. They will not be humiliated or treated like lesser humans. ‘No trains, fine! We will walk the 130 kilometres to the Austrian border’ – and so an Exodus of refugees not seen in #Europe since World War II begins. They make me so proud. From the toddlers seen putting one foot in front of the other and still managing to smile to the elderly trying to keep up, their courage and sheer grit is an inspiration to us all. God bless countries like #Germany, #Sweden and #Iceland that have put out a welcome mat, but this tragic situation is not #Europe’s responsibility. Those poor people are Arabs, both Muslim and Christian. The inaction of #Arab leaderships has forced not only Syrians but also Iraqis to seek safety wherever they can find it. Why should we expect the EU to pick up the pieces of our neglect? Our #Arab nation has collectively done nothing to rid #Syria of the criminal #Assad regime, whose viciousness turned this once beautiful historic land into a cesspool of violence and destruction. It will take generations to return #Syria to any semblance of its former glory; lost forever are ancient mosques, temples, monasteries and churches, blown up by mad creatures who dare to call themselves Muslims. More importantly, lost forever are 300,000 human beings – and counting. How many of those souls trudging along a Hungarian highway will ever see their homeland again I wonder? I was deeply touched by the message of a young boy standing outside the #Budapest train station, who said he did not want to be in #Europe. What he wants is for the world to stop the war in his country so he can go home. I have heard so many others say the same thing. But no one is listening. No one is doing anything. Those people are not economic migrants. They are not freeloaders out to live on state handouts. They are fleeing war and persecution with rights under the UN’s Refugee Convention which stipulates that no refugee must be discriminated against in terms of race or religion. The #Arab states have failed the Syrians and unless the leaderships do the right thing, Syrians will never be able to forgive the Arabs for abandoning them in their hour of need. The day will come when our grandchildren will ask what we did to save them. What shall we tell them, other than we sent some money and dropped a few bombs? Just about everyone I know is upset about a photograph of two-year-old #Aylan_Kurdi lying face down on the sand of a Turkish beach. The terrible fate of this angelic child has put a human face to the Syrian conflict, galvanizing European public opinion in the refugees’ favour. Banners reading “Welcome Syrian Refugees” are appearing among the crowds in football stadiums. Thousands gathered in #Vienna chanting their welcome. Some 10,000 Icelanders offered homes to Syrians. More than 260,000 Britons signed a petition demanding Prime Minister David #Cameron agree to accept more. 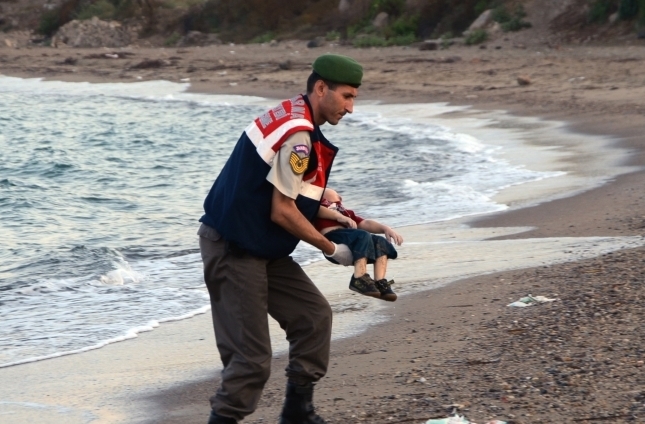 There are good people in #Europe who care, so why can’t we? It is no good saying, “It is not our problem”. God is watching. I can only plead with #Arab leaderships – especially leaders of Gulf States – to immediately respond to this emergency by firstly doing all in their power to host as many refugees as possible. More importantly, I would urge #GCC states and their #Arab allies to tackle this problem at its root. Just as we are fighting to free Yemen from Iranian proxy militias, so we must use all our resources to save #Syria from its brutal pro-Iranian puppet and the other blood-thirsty mobs. What has happened to the #Arab DNA since the days of caliphs who looked after their people’s wellbeing and fought for their dignity? Not only lives are at stake. So is what we once valued above all – our #Arab honour. Respected and Dear Sir, First of all I appreciate your insights in this column pertinent to the suffering of our Syrian brothers and sisters, the visuals shown in the media are really horrible and shocking. After watching the plight of the refugees in Europe I feel so helpless that my heart goes out for them and during each SALAATH I humbly beg the almighty ALLAH to put an end to this crisis and reveal the best of HIS MERCIES on them. Syria has literally become a play ground for world’s super powers victimizing the innocent Syrians. As you said in your article that something has to be done for these less fortunate Muslim Brothers and Sisters, really this is the right time to extend a helping hand to them and build their confidence lest the future generations do not have dark memoirs to nurture with. Hats off to your views and I salute your humble thoughts Sir. A great thoughtfulness can only be stated like this... Hence it is rightly done by a good leader in nice way as a awakening message. May Allah Keep Us Guided... Aameen!! !